Whoever you invite to this spectacular event, you are offering your guests an exclusive experience beyond comparison! For all those who believe to have seen it all and are not easy to please – the St. Moritz ice track is much more than simply a thrill and a challenge. We at icerunner offer you and your guests an overwhelming team experience with a lasting impact. And just as you, each participant pilots his Monobob through the ice track by himself. What normally is reserved for professionals, is made possible by icerunner events for select groups. Ice track specialist Gregor Stähli looks after each participant individually and ensures that all rides in the Monobob will be a unique and unforgettable experience. Four solo descents on the Olympic Bob Run St. Moritz – for each of your guests. Experience the legendary ice track yourself and conquer it at high speed. Four unique highlights in the context of a top-class supporting program in a charming environment. 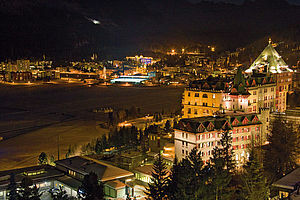 Top of the World in every respect and guaranteed by us: St. Moritz dazzles you in its best light 24 hours a day! The journey itself is an event. We will organize bus, train, jet, helicopter – everything you may wish for so that your guests from the various starting points arrive comfortably and in good spirits at the one destination: St. Moritz. You and your guests will be accommodated in premium-class hotels and enjoy the à la carte event gastronomy. Sporting highlights alternating with exchanges, relaxation and enjoyment. And all this in a breathtaking scenery and a setting which will amaze your guests. All highlights including the descents on the bob run will be captured by professionals in pictures and on video, without fail. You will once again be able to pleasantly surprise your guests with the photographic or DVD documentation which will have effectively captured the most exciting moments for the record. By all accounts, the Monobob events are guaranteed to remain unforgettable! With vivid pictures and videos you add an extra touch and the splendid memories of this event will forever be associated with you and your company as the hosts. Who will cold-bloodedly pilot the Monobob through the legendary bob track in St. Moritz? You and your chosen customers? Your colleagues and teams? Your friends? The choice is yours.